This Tibbit is based on the CPC1965 AC solid state relay and is implemented as the H1 hybrid device. The CPC1965 is capable of handling AC voltages of up to 260V and load currents of up to 1A. 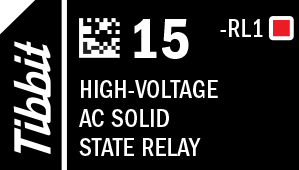 To activate the relay set the control line LOW. When left unconnected, the line defaults to HIGH (and, hence, the relay is off). There is a single red LED, which lights up when the control line is LOW (i.e. when the relay is activated). Tibbo does not advertise the use of this Tibbit for the commutation of high voltages and assumes no responsibility for any injuries and/or damage caused by the use of this Tibbit. By purchasing this Tibbit you agree to use it at your own risk and accept all full responsibility for such use.